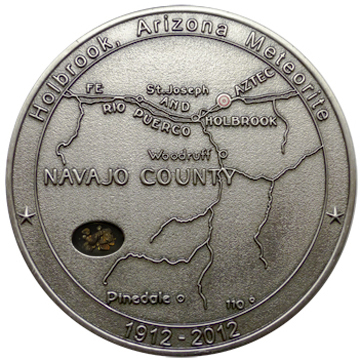 Nakhla Dog Meteorites is happy to announce its newest meteorite coin celebrating 100 years of Holobrook. The obverse of the coin depicts W.M. Foote's location map as featured in his 1912 monograph: Preliminary Note on the Shower of Meteoritic Stones at Aztec, near Holbrook, Navajo County, Arizona. Inset is a sample of dust from the Holbrook fall that includes grains from material collected on the 100 year anniversary by meteorite hunters Jim and Wendy Wooddell. The reverse of the coin depicts the iconic illustration "Hail of Stones" as printed in the October 6, 1946 edition of the Italian newspaper La Domenica Del Corriere which was well know for its sensationalistic illustrations of natural events. Extreme care was taken to accurately capture this image on the coin. Each coin is individually numbered 001-300.